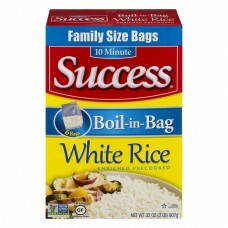 Success® White Rice Boil in Bag. Family size bags. 10 minute. 6 bags. Enriched precooked. Non GMO Project Verified, nongmoproejct.org. Certified GF Gluten-Free. Net wt 32 oz (2 lb) 907g. Good source of folic acid. No measure, no mess. Cooks in 10 minutes. Grown in the USA Rice®. 100% recyclable. Riviana Foods Inc has a firm commitment to respect and conserve the environment and seeks to minimize the impact of our operations on our planet. Success® rice cartons are 100% recyclable in most communities. Our boil-in-bag is made of BPA-free #2 plastic, which is also 100% recyclable. Our guarantee: If Success® rice doesn't cook perfectly every time, we will refund the full purchase price. Limit one refund per household. Just send the entire bottom panel along with the specific reason for your refund to: Success Rice Refund, Consumer Relations P.O. Box 5400, Largo, FL 33779. Please have package available when calling. Monday-Friday 8am to 4pm central time. This carton is 100% recyclable. ®Success and Riviana are registered trademarks of Riviana Foods Inc. Call: 1-800-226-9522. successrice.com. To prepare rice "out-of-the-bag," visit, successrice.com/outofthebag Visit successrice.com for a variety of recipes and product information. ©2017 Riviana Foods Inc.
Rangetop directions: Each bag makes about 3 cups. 1. Pour about 4 cups (1 quart) of water into medium saucepan and submerge 1 bag of rice (use about 3 quarts of water in large saucepan for 2 bags). Bring water to a boil and boil uncovered 8-10 minutes. 2. Remove bag from water with fork and drain. Cut open bag and empty rice into serving dish. Fluff with fork and add salt and butter if desired. Cooked Success® rice can sit in hot water with the heat off for up to 30 minutes. Microwave directions: Each bag makes about 3 cups. 1. In a 2-quart microwave-safe bowl, submerge 1 bag of rice in about 4 cups (1 quart) of water. (We do not recommend using the microwave to cook multiple bags.) 2. Microwave on high 10 minutes. 3. Remove bag from water with fork and drain. Cut open bag and empty rice into serving dish. Fluff with fork and add salt and butter if desired. Microwave ovens vary. Cooking times are approximate.